This Green Tea, Kale and Cacao Nibs Smoothie brings together some of the healthiest ingredients on the planet. If you don’t feel zingy after drinking this, you probably need some serious help. Or another serving – we’d definitely recommend trying that option first. This smoothie is bursting with goodness, is rich in anti-oxidants and can help boost your mood too. Green tea contains catechins, antioxidants that combat cell damage and can help reduce cholesterol and high blood pressure. Kale, as you know, is just all round, top notch wonderful, helping to reduce cholesterol too (you’ll have none left at this rate!) and, among its many other benefits, it has anti-inflammatory qualities so it’s great for runners. As if that’s not enough, this Green Tea, Kale and Cacao Nibs Smoothie has cacao nibs, as you probably surmised. These little beauties contain magnesium, iron and fibre, plus they act on our neurotransmitters to help make us feel better. Expect a blissful day if you have this at breakfast time. I don’t usually sweeten smoothies but you can add a little agave or maple syrup if you like. You can also make this smoothie with natural or use non-dairy yoghurt if you want a vegan version. I got all of my lovely ingredients from the fantastic new Ocado vegetarian range, well worth spending some time browsing. Be warned though: you’ll want it all. 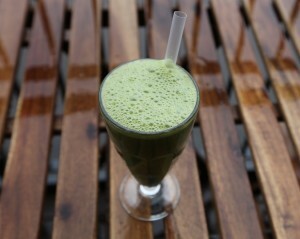 Healthy Green Tea, Kale and Cacao Nibs Smoothie, full of antioxidants to start your day with a boost. Put all of the ingredients in your blender and buzz until smooth. What are cocoa nibs and where do you find them? You can get them from health food stores and increasingly in supermarkets too. They’re from the same cacao beans that get made into chocolate but they’re less refined and more beneficial nutritionally. Does this tend to give people digestive upset i.e. diarrhea?